Unfortunately, I have never had the pleasure of traveling to Spain, although it is on my travel bucket list of places that I would love to visit. With that said, my sister had the pleasure of honeymooning in Barcelona and told me that it's a beautiful place to visit that is rich in cultural history and activities. 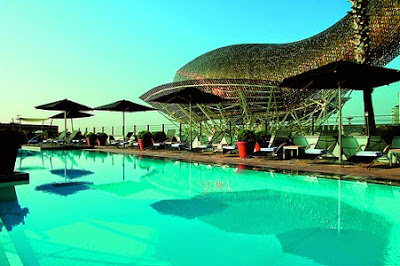 I know that many of my travel blog readers are working on their vacation plans and looking for fun destinations to visit, so I wanted to pass on this information about the Hotel Arts Barcelona that was recently sent in to me to share with all of my blog readers. Looks beautiful for sure and definitely my type of travel destination! Hotel Arts Barcelona is at the forefront of a new European lifestyle trend of Sunday brunching with the introduction of the new Arola brunch. 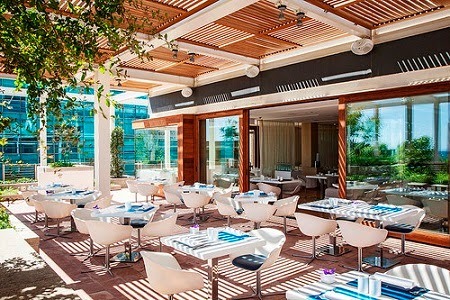 Beginning this May, Hotel Arts Barcelona has introduced an all-encompassing Sunday brunch experience on the terraces of its renowned restaurant, Arola. Considered a longstanding tradition in the US, brunch has recently taken off in Barcelona and is rapidly becoming a weekend ritual for many residents and visitors. As a trendsetter in the industry, Hotel Arts Barcelona has embraced this movement and created an authentic Catalan culinary experience at the ideal Mediterranean location to spend Sundays. The new brunch will cater to the needs of both experienced epicurean enthusiasts and less gastronomically versed travelers, with its varied dishes and activities to partake in while brunching at Arola. As part of the innovative brunch experience, Arola has crafted an original prix fixe menu for adults and children to highlight the striking flavors of local ingredients. It encompasses signature dishes such as Eggs Benedict by Arola with toast, confit pork jowls and foie gras. Guests will also be tempted to taste other creations of Michelin-starred Chef Sergi Arola, who has succeeded in revitalizing traditional Catalan favorites such as Cuttlefish with black rice and peas. Aside from its diverse main course menu, the brunch will also feature treats for all ages. 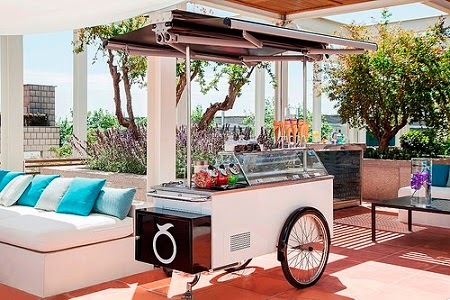 Children will be welcomed to indulge in seasonal ice creams and sorbets served from a classic ice-cream cart while an outdoor bar will hold appeal for adults, serving gin & tonics and cocktails made with ingredients sourced from the restaurants own garden. Arolas brunch experience stands out amongst a burgeoning trend in Europe with the numerous additional activities and services available onsite. An outdoor area, set up with communal, family-friendly activities like table tennis and foosball, is designed to make for a memorable meal. Set against the backdrop of the Mediterranean Sea, with lively tunes spun by a local DJ, Arola is fast becoming the Mediterraneans Sunday afternoon brunch forerunner. About Hotel Arts Barcelona: Hotel Arts Barcelona boasts stunning panoramic views from its unique location on the waterfront, in the heart of the citys Olympic Village area. Designed by renowned architect Bruce Graham, Hotel Arts features 44 floors of exposed glass and steel, making it a prominent feature of Barcelonas skyline. The waterfront hotels 455 rooms and 28 exclusive duplex Apartments feature sleek, modern design complemented by an impressive 20th century collection of works by contemporary Catalan and Spanish artists. The only hotel in Spain featuring two Michelin-starred chefs, Hotel Arts is one of the premier culinary destinations in Barcelona with Enoteca and Arola restaurants. Guests seeking a serene escape may enjoy signature treatments in the 43rd floor spa. Recognized as one of the top business hotels in Spain, Hotel Arts provides over 3,000 square-feet of function space overlooking the Mediterranean in Arts 41, for board meetings and conferences as well as social events, weddings and celebrations. The hotel offers an additional 24,000 square-feet of function space, with the main meeting space located on the lower ground and second floors. For more information, please visit http://www.ritzcarlton.com/en/Properties/Barcelona/Default.htm. Disclosure: I was not compensated for this post. The information and photos are copyright by the Hotel Arts Barcelona.